(Utsunomiya, Japan)—Trek-Segafredo will race special edition high-visibility team kits and Project One bikes in the upcoming Japan Cup criterium and road race. The new kits and bikes, which will be unveiled at Saturday’s Japan Cup criterium, carry forward Trek’s safety message regarding the importance of on-road detectability. Increasing rider safety is a core value for Trek. The company recently released the results of an ongoing safety study about rider visibility, conducted in partnership with students at Clemson University’s Perceptual Awareness department. The results of the study formed the foundation of the company’s safety message, the ABCs of Awareness. The ABCs of Awareness—Always on (ride with lights, day and night), Biomotion (highlight the body’s moving parts), and Contrast (fluorescent during daylight, reflective in low-light conditions)—are the simple steps every rider can take to increase detectability. Trek-Segafredo’s special edition Japan Cup kits and bikes serve as a reminder to all cyclists of the importance of wearing colors that contrast with the environment. 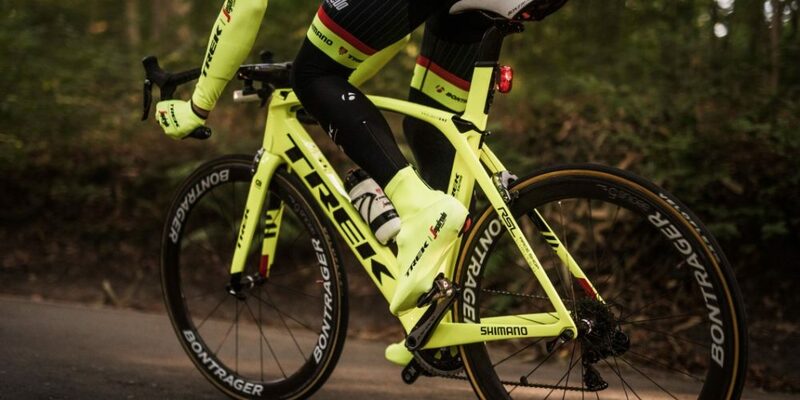 According to a 2015 study conducted at Denmark’s Aalborg University, a rider wearing fluorescent in daylight can decrease the risk of an incident by as much as 53% (Lahrmann & Madsen, 2015). After the completion of the Japan Cup, the kits will be adopted by the entire team as their standard training kit. The team racing in Japan will be made up of Fabian Cancellara, 2015 Japan Cup road race champion Bauke Mollema, 2015 Japan Cup criterium champion Fumy Beppu, Gregory Rast, Jasper Stuyven, and Eugenio Alafaci.